Gastric neuroendocrine neoplasia has been classified as neuroendocrine tumor (NET), a less-malignant type, and neuroendocrine carcinoma (NEC), a more-malignant type. We investigated phenotypic expression profiles to clarify the differences between NET and NEC in terms of histopathology and carcinogenesis. We assayed 86 cases of gastric neuroendocrine neoplasms (NET G1, n = 25; NET G2, n = 9; NEC, n = 52), using six exocrine markers (MUC5AC, human gastric mucin, MUC6, M-GGMC-1, MUC2, and CDX2). NEC frequently coexisted with adenocarcinomatous components (75 %; 39 of 52) and the majority (71.8 %; 28 of 39) showed intraglandular endocrine cell hyperplasia, although no cases of NET showed adenocarcinomatous components. Mucin phenotype significantly differed between NET and NEC; none of NET cases expressed any exocrine markers other than CDX2, although the majority of NEC (86.5 %; 45 of 52) expressed at least one or more exocrine markers with various positive rates for each marker (range, 8.2–74.0 %). 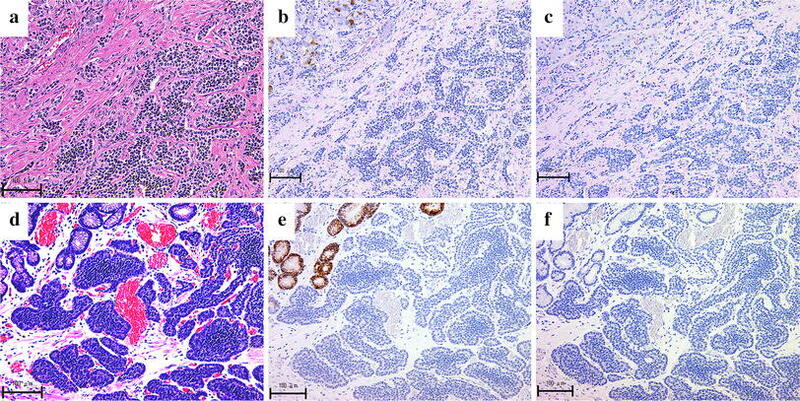 Each NEC component showed only the phenotype expressed in the adenocarcinomatous component in the same tumor. Furthermore, double immunohistochemistry revealed dual expression of CDX2 and chromogranin A in half the NEC cases (23 of 46). These data suggest that gastric NETs (G1 and G2) and NECs have different processes of carcinogenesis, and gastric NECs may be generated from preceding adenocarcinomas. K. Domori and K. Nishikura contributed equally to this work. Recent population-based studies of gastric neuroendocrine neoplasms have shown an annual incidence of 0.18–0.39 per 100,000, with the incidence showing an incremental trend [1, 2]. 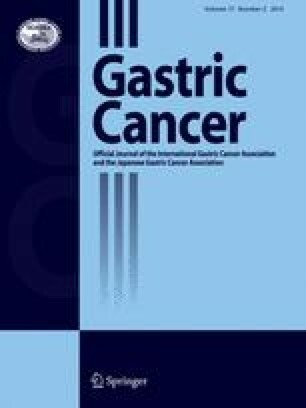 Gastric neuroendocrine neoplasms accounted for 2.4–3.3 % of all gastrointestinal neuroendocrine neoplasms in study series from the United States or Europe, whereas a much higher incidence of 27.3 % has been reported in a Japanese series . Neuroendocrine neoplasms include neuroendocrine tumor (NET) and neuroendocrine carcinoma (NEC), which are strictly distinguished on the basis of morphological criteria and the assessment of proliferation fraction. The European Neuroendocrine Tumor Society has proposed tumor grading into three tiers (G1, G2, G3) based on mitotic count and Ki-67 labeling index (LI) . In the 2010 World Health Organization (WHO) classification , these tumors are mainly divided into five categories, as follows: (1) NET G1, well-differentiated endocrine tumor (carcinoid); (2) NET G2; (3) NEC; (4) mixed adenoneuroendocrine carcinoma (MANEC); and (5) hyperplastic and preneoplastic lesions. Gastric NET G1 is a low-grade malignant tumor demonstrating favorable prognosis with limited growth within mucosa through submucosal and, rarely, angioinvasion. NET G2 usually shows sporadic occurrence, relatively large size, and aggressive behavior with invasion of the muscularis propria or beyond and angioinvasion. NEC is particularly aggressive, with high frequencies of lymphatic/vascular invasion, distant metastasis, and poor prognosis [5, 6]. The tumorigenic pathways leading to the two types of gastric NET (type I, associated with autoimmune chronic atrophic gastritis; type II, associated with multiple endocrine neoplasia type 1 and Zollinger–Ellison syndrome) have been established, with development through a sequence of hyperplasia–dysplasia–neoplasia under hypergastrinemic condition . However, the tumorigenesis of gastric NEC remains unclear, although gastric NECs have been reported to frequently exhibit an adenocarcinomatous component, and a tumorigenic pathway of gastric NEC arising from a coexisting adenocarcinomatous component has been proposed [8, 9]. To confirm this hypothesis, we investigated the expression of mucin core proteins and CDX2 in gastric neuroendocrine neoplasms. As studies of mucin core proteins have developed, phenotypic expression of gastric adenocarcinomas has been clearly revealed by immunohistochemistry using gastric/intestinal epithelial cell markers [10, 11, 12, 13, 14, 15, 16]. Furthermore, the caudal-type homeobox gene Cdx2 encodes a transcription factor that has been found to play an important role in the mammalian intestine [17, 18] and which is reported to demonstrate a close relationship to the intestinal phenotype in gastric adenocarcinomas [19, 20, 21, 22]. Neuroendocrine neoplasms have so far been discussed with a view to endocrine differentiation, and few reports in the English literature appear to have investigated mucin expression in gastric neuroendocrine neoplasms [23, 24]. We investigated the expression of exocrine markers using immunohistochemical methods in gastric neuroendocrine neoplasms to clarify differences in carcinogenesis among these neoplasms. The material assayed comprised 86 cases of gastric neuroendocrine neoplasms that had been registered in the file of the Division of Molecular and Functional Pathology, Niigata University Graduate School of Medical and Dental Sciences, from 1976 through 2010. Of the 86 cases, 25 were diagnosed as NET G1, 9 as NET G2, and 52 as NEC. All tumors were surgically resected (67 cases) or endoscopically resected (19 cases) without systemic adjuvant therapy from 86 Japanese patients at Niigata University General Hospital and its affiliated institutions in Niigata Prefecture, Japan. All specimens were fixed in 10 % formalin solution, and whole sections were then embedded in paraffin blocks. The diagnosis of gastric neuroendocrine neoplasms was reconfirmed in a review by two pathologists (K.D. and K.N.) to obtain clinical information and histopathological analysis. Endocrine differentiation of tumor cells was confirmed by diffuse and intense immunoreactivity of at least one endocrine marker, including chromogranin A, synaptophysin, neuron-specific enolase (NSE), and neural cell adhesion molecule (NCAM), also known as CD56. According to the European Neuroendocrine Tumor Society scheme and 2010 WHO classification , we classified these endocrine neoplasms into three groups: (1) NET G1, mitotic count <2 per 10 high-power fields (HPF) and/or ≤2 % Ki-67 LI; (2) NET G2, mitotic count 2–20 per 10 HPF and/or 3–20 % Ki-67 LI; and (3) NEC, mitotic count >20 per 10 HPF and/or >20 % Ki-67 LI. Furthermore, we divided NEC into two subgroups: NEC with an adenocarcinomatous component (AdenoNEC); and NEC without an adenocarcinomatous component (pure NEC, PNEC). Particularly in AdenoNEC, we distinguished the adenocarcinomatous component (Ad component) and the NEC component, and evaluated the relationships of phenotypic expression between these two components. Furthermore, we regarded cases of AdenoNEC in which each component exceeded 30 % as representing MANEC. The most deeply invasive section for each tumor was selected, and corresponding paraffin blocks were consecutively cut for immunohistochemistry after a representative section was stained with hematoxylin and eosin (H&E). Immunohistochemical procedures were performed with a high polymer method using Histofine Simple Stain MAX-PO (MULTI) (Nichirei Biosciences, Tokyo, Japan). For antigen retrieval, sections were deparaffinized and rehydrated, and microwaved at 98 °C for seven cycles of 3 min [for MUC5AC, human gastric mucin (HGM), MUC6, MUC2, CDX2, synaptophysin, NSE, CD34, and D2-40] or autoclaved at 121 °C for 20 min (for chromogranin A, CD56, Ki-67, and p53) in 10 mmol/l sodium citrate buffer (pH 6.0, for all sections). Endogenous peroxidase activity was inhibited by incubation with 0.3 % hydrogen peroxidase in methanol for 20 min. In all sections except Ki-67, nonspecific binding was blocked with 10 % normal goat serum. All sections were incubated overnight with the primary antibodies listed in Table 1. Sections were then incubated with the Histofine Simple Stain MAX-PO (MULTI) for 30 min at room temperature. Diaminobenzidine was used as the chromogen, and sections were counterstained with hematoxylin. To examine colocalization of exocrine and endocrine characteristics of tumor cells in neuroendocrine components, double immunohistochemical staining was employed for chromogranin A as an endocrine marker and CDX2 as an exocrine marker. CDX2 immunostaining was first applied as already described, using diaminobenzidine as the first chromogen (brownish color in nuclei). Subsequently, the sections were autoclaved at 121 °C for 20 min in sodium citrate buffer to dissociate the first antibodies. Chromogranin A immunostaining was then performed with peroxidase substrate as the second chromogen (red-purple color in cytoplasm) using a VIP peroxidase substrate kit (Vector Laboratories, Burlingame, CA, USA). Cytoplasmic reactivity with clear intensity was judged positive for MUC5AC, HGM, MUC6, M-GGMC-1, MUC2, and endocrine markers except CD56, membranous staining as positive for CD56, CD34, and D2-40, and nuclear staining regardless of intensity as positive for CDX2, Ki-67, and p53 protein. Immunostaining of p53 protein was evaluated semiquantitatively and judged as overexpression when positive cells were distributed focally (positive cells, 5–50 %) or diffusely (positive cells, >50 %) throughout the tumor. Ki-67 LI was evaluated by scoring the percentage of unequivocally positive cells per at least 1,000 tumor cells in the highest scoring fields. Angioinvasion and lymphatic invasion were confirmed by immunostaining for CD34 and D2-40, respectively. The extent of reactive cells for exocrine markers was semiquantitatively estimated according to the percentage of positive cells to the total number of tumor cells in each stained section, with the percentage divided into five grades: grade 1 (positive cells, 0 %< X ≤ 5 %); grade 2 (5 %< X ≤ 10 %); grade 3 (10 % < X ≤ 25 %); grade 4 (25 % < X ≤ 50 %); or grade 5 (>50 %). Grades 2–5 were judged as representing positive immunoreactivity. For double immunohistochemistry, simultaneous immunoreaction in both cytoplasm and nucleus of a tumor cell was judged as positive. The percentage of positive cells was divided into five grades from grade 1 to grade 5 using the same criteria already described. MUC5AC, HGM, MUC6, and M-GGMC-1 were defined as markers of gastric phenotype, the former two as markers for gastric foveolar epithelia and the latter two as markers for gastric pyloric glands. HGM and M-GGMC-1 reportedly recognize carbohydrate side chains, whereas MUC5AC and MUC6 recognized mucin core proteins [10, 11, 12, 13, 14, 15, 16]. MUC2 and CDX2 were selected as markers of intestinal phenotype. Combining these markers, the neoplastic phenotype was classified into four categories: gastric type (G type), intestinal type (I type), gastrointestinal type (GI type), or null type (N type) . The neoplastic phenotype of the coexisting adenocarcinomatous component in AdenoNEC cases was also classified into the four categories as described. The G-type included tumors that were positive for at least one of four gastric-type mucins and negative for intestinal markers; the I-type included tumors that were positive for one or both intestinal markers and negative for gastric markers; the GI-type included tumors that expressed positivity for both gastric and intestinal markers; and the N-type included those that stained negatively for any markers. Statistical analyses were performed using PASW Statistics version 17.0 software (SPSS Japan, Tokyo, Japan). The Kruskal–Wallis test and Fisher’s exact or χ2 test were used to compare the three groups, and Bonferroni’s correction was used to perform a multiple comparison. The McNemar test and Wilcoxon test were used to compare the paired date of two components. Statistical significance was accepted for values of p < 0.05. Clinicopathological features of the 86 cases studied are summarized in Table 2. Among three groups, significant differences were seen in tumor size, mitosis, and Ki-67 LI (NET G1 vs. NET G2, NET G1 vs. NEC, and NET G2 vs. NEC); in frequency of mp-invasion, lymphatic invasion, and angioinvasion (NET G1 vs. NET G2 and NET G1 vs. NEC); in age and p53 protein overexpression (NET G1 vs. NEC and NET G2 vs. NEC); and in lymph node metastasis (NET G1 vs. NEC). There were 25 cases of NET G1, 9 cases of NET G2, and 52 cases of NEC, including 39 (75.0 %) of AdenoNEC cases and 13 (25.0 %) of PNEC cases. All NET G1 and G2 cases showed homogeneously intense reactivity for each endocrine marker. NET G1 was characterized by a microlobular to small nodular alveolar structure formed by uniformly small cells with regular nuclei and rather abundant eosinophilic cytoplasm. NET G2 consisted of large trabeculae, crowding and irregular distribution of round to spindle-shaped and polygonal tumor cells, either with fairly large vesicular nuclei and prominent eosinophilic nucleoli, or with smaller, hyperchromatic nuclei, irregular chromatin clumps, and small nucleoli. NEC tended to show relatively weak and heterogeneous positivity for endocrine markers as compared with NET. NEC comprised large, poorly formed trabecular nests composed of anaplastic round, polygonal to spindle-shaped cells with large, irregular, pleomorphic, and hyperchromatic nuclei and evident nucleoli. No cases of NET G1 or G2 demonstrated adenocarcinomatous components. Of the 39 AdenoNEC cases, 12 (30.8 %) were diagnosed as MANEC and the remaining 27 (69.2 %) as non-MANEC. In all MANEC cases, exocrine and endocrine components were juxtaposed within the tumor, although some cases showed partially admixed areas. Almost all non-MANEC cases had a more extensive area of NEC components than Ad components, although only 1 case showed a dominant Ad component. Furthermore, 71.8 % (28 of 39) of AdenoNECs demonstrated intraglandular endocrine cell hyperplasia in the Ad component and 56.4 % (22 of 39) showed extraglandular budding nests of endocrine cells in the Ad component (Fig. 1). Results of immunostaining for mucins and CDX2 in gastric neuroendocrine neoplasms are summarized in Table 3. In NET G1 and G2, no cases expressed any mucin markers and six cases (three cases of NET G1 and three cases of NET G2) expressed only CDX2 (Fig. 2). CDX2-positive NET G1 cases displayed a low percentage of positive cells (one case with grade 2 and the others with grade 3), and the NET G2 cases showed various percentages (one case with grade 2 and the others with grade 5). In contrast, NEC cases expressed relatively higher positivity in each mucin marker (range, 8.2–42.3 %) and CDX2 (74.0 %) compared with NETs. The Ad component in AdenoNEC demonstrated CDX2 immunoexpression in 97.3 % (36 of 37), and 80.6 % (29 of 36) were grade 4 or higher (Fig. 3). All exocrine markers except M-GGMC-1 differed significantly between NET G1 and NEC, but not between NET G1 and NET G2. As a result, proportions of phenotypic classifications differed significantly between NEC and NET. Double immunostaining revealed simultaneous immunoreactions for both CDX2 and chromogranin A within the same tumor cells in 9.1 % (2 of 22; both cases with grade 2) of NET G1, 37.5 % (3 of 8; 2 cases with grade 2 and 1 with grade 5) of NET G2, and 50.0 % (23 of 46; 10 cases with grade 2, 3 cases with grade 3, 2 cases with grade 4, and 8 cases with grade 5) of NEC, respectively (Fig. 4). All exocrine markers showed higher positivity in the Ad component than in the NEC component in AdenoNEC. Each exocrine marker expressed relatively higher positivity in the NEC component of AdenoNEC cases compared with that of PNEC cases (MUC5AC, 34.2 vs. 7.7 %, p = 0.082; HGM, 37.8 vs. 0 %, p = 0.010; MUC6, 43.6 vs. 38.5 %, p = 0.755; M-GGMC-1, 11.1 vs. 0 %, p = 0.562; MUC2, 38.5 vs. 7.7 %, p = 0.044; and CDX2: 81.1 vs. 53.8 %, p = 0.445) (Fig. 5). Results of phenotype in AdenoNEC are summarized in Table 4. In the NEC component of AdenoNEC, the GI phenotype and I phenotypes were dominant, with 43.6 % (17 of 39) and 35.9 % (14 of 39), respectively, whereas the N type represented only 7.7 % (3 of 39). As to the Ad component of AdenoNEC, the most frequent phenotype was GI type (87.2 %, 34 of 39), and no N-type cases were seen. Furthermore, each NEC component showed only those phenotypes expressed in the Ad component; that is, phenotypes that were not expressed in Ad components were never seen in NEC components. On the other hand, phenotypes in PNEC were 30.8 % GI type (4 of 13), 23.1 % I type (3 of 13), 15.4 % G type (2 of 13), and 30.8 % N type (4 of 13), respectively, representing a similar order to AdenoNEC, but with a higher proportion of N type (30.8 %) compared with AdenoNEC (7.7 %, 3/39). No significant differences in phenotypic expression between MANEC and non-MANEC (data not shown) were seen in AdenoNEC cases. In terms of proliferative activity, NEC components showed significantly higher Ki-67 LI than Ad components in non-MANEC cases (NEC vs. Ad, 69.3 vs. 50.1 %, p = 0.002), although the opposite was seen in MANEC cases (NEC vs. Ad, 58.8 vs. 64.6 %, p = 0.136). For reference, the Ki-67 LI of the NEC component in PNEC was 66.7 %. As for tumor invasiveness, non-MANEC showed more cases with invasion into the muscularis propria or deeper than MANEC [non-MANEC vs. MANEC; 88.9 % (24 of 27) vs. 41.7 % (5 of 12), p = 0.004]. Furthermore, all (24 of 24) AdenoNEC cases with lymph node metastases demonstrated only endocrine carcinoma cells but no adenocarcinoma elements in metastatic foci. Gastric NECs are generally accepted as a relatively rare cancer (5.9–7.8 %) [6, 25]. According to our records, NEC cases accounted for 60.5 % (52 of 86) of gastric neuroendocrine neoplasms. Japan is well known to have one of the highest incidences of gastric cancer. There may be a possibility that biased samples were assayed, but a higher incidence of gastric NEC might be plausible if we take the hypothesis in consideration that gastric NEC may be generated from coexisting adenocarcinomatous components. Iwafuchi et al. reported that gastric NECs frequently contained Ad components (72.5 %, 37 of 51), with 97.3 % (36 of 37) representing differentiated type. Nishikura et al. also reported a high frequency of Ad components (70.6 %, 48 of 68), with 87.5 % (42 of 48) representing differentiated type. Our results were consistent with this, with 75 % (39 of 52) of NEC cases showing an Ad component and 97.4 % (38 of 39) of AdenoNEC cases including differentiated-type Ad components. However, no cases of NET (G1 and G2) demonstrated Ad components in the same tumor. We immunohistochemically analyzed the expression of exocrine markers and endocrine markers of NEC to clarify the nature of tumor cells and histogenesis compared to those of NET. As previously reported [10, 11, 12, 13, 14, 15, 16], the distributions and positivity rates of MUC5AC and HGM, as well as those of MUC6 and M-GGMC-1, are different. Furthermore, CDX2 is reported to be closely associated with intestinal phenotype expression in human gastric carcinomas [19, 20, 21] and a more sensitive marker than MUC2 for assessing the presence of intestinal phenotypic expression in gastric adenocarcinomas from the early stage . We therefore employed each of these markers to accurately determine the mucin phenotype of carcinomas. Significant differences were seen between NET G1 and NEC in the five exocrine markers, and NET G2 showed similar findings to NET G1, but no significant differences were evident between NET G2 and NEC because of the few cases of NET G2. These results allow us to speculate that most cases of NET G1 and G2 consist almost entirely of endocrine cells and may be generated from a similar endocrine linage. On the other hand, both AdenoNEC and PNEC demonstrated GI type or I type in a majority of cases, suggesting that NEC has both exocrine and endocrine potentialities. Considering these results, a definitive difference in tumorigenesis between NETs (G1 and G2) and NEC seems reasonable. NET G2 may be generated from NET G1 as the tumor grade develops (Fig. 6a). The NEC component in AdenoNEC did not express any kind of phenotype that was not expressed in the Ad component, possibly suggesting that the NEC is generated from a preceding adenocarcinoma. Furthermore, 71.8 % (28 of 39) of AdenoNEC demonstrated intraglandular endocrine cell hyperplasia in the Ad component and 56.4 % (22 of 39) showed extraglandular budding nests of endocrine cells in the Ad component, also supporting the possibility of dysdifferentiation of adenocarcinoma cells to endocrine cells. Double immunohistochemical staining indeed revealed that tumor cells in half the NEC cases (23 of 46) demonstrated dual expression of CDX2 and chromogranin A, with 56.5 % (13 of 23) of cases grade 3 or higher. These results allow us to speculate on the colocalization of exocrine and endocrine expression in the tumor cells of neuroendocrine components of gastric NEC, and the relatively low frequency of dual expression may be the result of the limitations of low sample numbers and the double immunohistochemical staining procedure. Therefore, additional studies with other techniques, such as confocal microscopy with a larger number of samples, are needed to prove our data and further clarify the possible amphicrine nature of gastric NET. In gastric MANEC, the neuroendocrine component generally is constituted of NEC or rarely NET [26, 27], and the incidence of gastric MANEC is not yet well established. According to our records, none of the 12 MANEC cases consisted of NET (G1 or G2). As for proliferative activity, the NEC component showed a significantly higher Ki-67 LI than the Ad component in non-MANEC cases (NEC vs. Ad, 69.3 vs. 50.1 %, p = 0.002), although the opposite was seen in MANEC cases (NEC vs. Ad, 58.8 vs. 64.6 %, p = 0.136). Furthermore, non-MANEC showed a higher frequency of deep invasion (mp or deeper) than MANEC [non-MANEC vs. MANEC, 88.9 % (24 of 27) vs. 41.7 % (5 of 12), p = 0.004]. Considering these results, the carcinogenic pathway could potentially proceed as follows (Fig. 6b): (1) an NEC component is generated from a preceding Ad component; (2) progression to MANEC with phenotypic features similar to the Ad component; (3) the NEC component of MANEC acquires higher proliferative activity than the Ad component and the Ad component may become necrotic or desquamate while the NEC component rapidly develops; consequently, (4) the NEC component represents the majority of the lesion and loses phenotypic features little by little, resulting in a shift to non-MANEC; and finally, (5) non-MANEC develops to PNEC. A few reports have provided genetic analyses of the carcinogenic pathway of gastric NEC. Nishikura et al. reported concordant mutational status of the p53 gene between the adenocarcinoma component and NEC component in 73.3 % (11 of 15) of gastric AdenoNECs and no mutation in gastric NET (0 of 5), supporting our hypothesis despite the limited number of samples. Further study with molecular analysis or gene microarray analysis with many samples would shed light on the underlying mechanisms and carcinogenic pathways in NET of the stomach. In conclusion, it is highly possible that gastric NET and NEC may well have different carcinogenic pathways, and gastric NEC arises from preceding adenocarcinoma, predominantly differentiated type and GI phenotype from the perspective of phenotypic expression. We thank all the staff in our laboratory for their technical assistance, particularly Miss Kazue Kobayashi for her excellent immunohistochemical work.